We dived SOOOOO many oranges recently. Bag, after bag of oranges. Why were so many oranges discarded you ask? Generally, an entire bag of something like oranges finds it's way into a dumpster because one of them is rotten. And regulations forbid opening the bag, washing the fruit and selling as bulk. We ate them. Juiced them. Dried out their skins. Candied their skins. 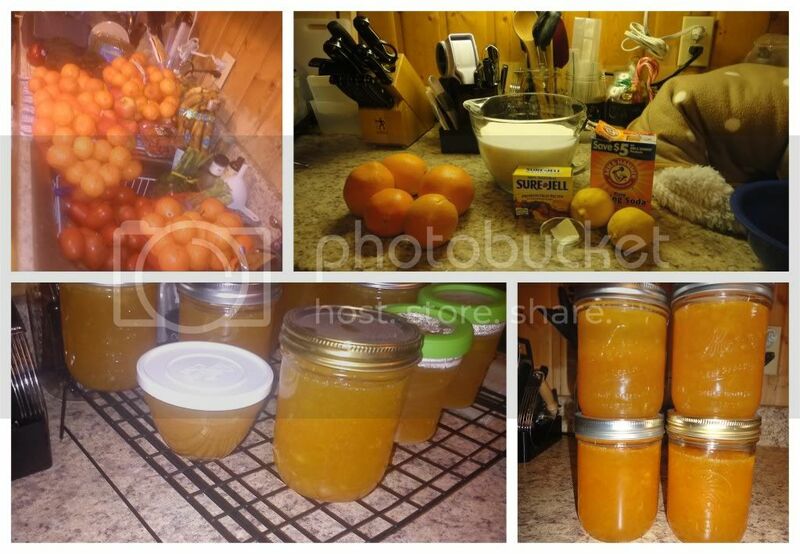 And made marmalade. This marmalade turned out better, more jelly-like, than my Lemon Marmalade, which I think is primarily due to the fact that I used pectin in this recipe. So, if you wanted to substitute lemons for the oranges in this recipe, I'm sure that would be acceptable. Begin boiling the water for the canning process...because it takes nearly forever. Prepare jars, lids, etc. For a double recipe I got about 6-7 pints. Remove peels from about 8 Oranges and 1-2 Lemons. Essentially, you want the orange/yellow part without the white, pith part. Throw the peels into a large pot with 5 cups of water and 1/4 tsp. Baking Soda, bring to a boil. Reduce heat to medium-low and simmer for about 20 minutes, stirring occasionally. Meanwhile, juice your oranges and lemons - discarding the pithy-white peels. Add juice after 20 minutes and continue to simmer for another 10 minutes. Measure 8 cups of this mixture (adding water if necessary) into a large stockpot. Stir in 2 boxes of Sure-Jell Pectin followed by 1 tsp. Butter (helps reduce foam - who knew?). Bring mixture to full boil, stirring occasionally. Stir in 8-11 cups of Sugar (to taste). Bring to a boil and boil for exactly one minute, stirring constantly. Remove from heat, skim off any foam and proceed to spoon into jars and process as you would other jams and jellies. Let set overnight or for 24 hours, check the seals and enjoy!